The name Biggin Hill is synonymous with the Royal Air Force and the Battle of Britain. In fact it has been around as an airfield for nearly 100 years and was purchased by Bromley Borough Council in 19974, the RAF finally vacating the property in 1992. Also in 1974 Regional Airports Ltd entered into a 125-year lease with the Council. 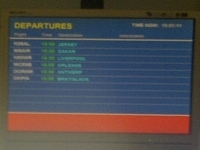 In more recent times Regional Airports has sold Southend Airport and is no longer the civil operator for RAF Northolt. Today Biggin Hill is the aviation gateway to South East London, the home of Formula One Ltd (five business jets), the owner of the international motor racing series, of 36 tenant companies, and the workplace for nearly 1,000 people. Probably another 500 are dependent on the airport for business. The Mayor of London has identified Biggin Hill as a Strategic Outer London Development Centre (SOLDC) in the London plan. Its strategic location makes the aerodrome complementary to Cambridge, Farnborough, Oxford, Luton, Southend and Stansted when competing for executive aviation business, but it does have a night closure, more of an occasional nuisance than an inconvenience. With an 1800m runway and Cat 3 landing facilities it can easily accommodate aircraft up to the size of Airbus Corporate Jet and Boeing Business Jet (BBJ). Whilst not cleared for scheduled passenger operations (which are effectively banned) it is well organised for private charters up to around 100 passengers (Avro 146 and Embraer E series size), with permanent Border Agency and lounge facilities. In terms of accessibility in fact Biggin is well sorted, although perceived less so. The problem is that the alternative business airports have motorway connections towards Central London, but as pointed out, these offer no flexibility when it comes to the regular problems that occur, and in fact are in all cases much further out. Biggin vies with (the very restricted London City) as being the only long haul jet airport within jurisdiction of the Greater London Authority. Biggin can be within 50 minutes by road of the Bank of England (Luton 55, both according to Google maps), and less than 40 minutes of Greenwich (and the nearby O2 Arena), both venues for Olympic events next summer. In fact London 2012 is targeted by the airport for major executive jet activity and increased visibility. An visionary plan to offer a six-minute helicopter shuttle to Ebbsfleet Eurostar station and then a 10-minute Javelin train ride to Stratford International seems to have got stuck with planning and cost problems. It could still happen but in any event the station is little more than 30 minutes car ride away and easily offers the best frequent service to the Olympic Park. Bromley South and Orpington stations can be as little as 10 minutes away and offer alternative routes to Central London. Victoria is two-class non-stop in 15 minutes to the heart of Westminster and central government. Orpington to London Bridge is much the same to London’s government headquarters, and the Shard, which will include a Shangri-La hotel. The airport has its own chauffeur service to the stations, offers quality terminal facilities, including refreshments, and a brand new 50,000sq ft hangar which takes in large integrated office and meeting accommodation. Whilst it has enough headroom to host a BBJ aircraft, maintenance is not offered and left to other airport residents. Under construction is a state of the art fire station. 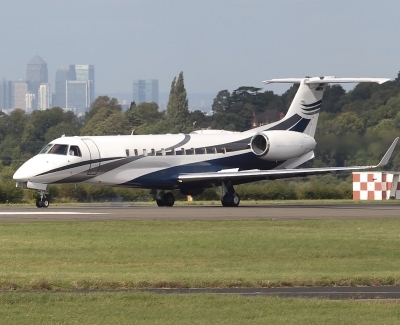 Biggin Hill’s latest tenant (the facility opened in April of this year), Qatar-owned Rizonjet says its raison d'etre is for London to come to the airport rather than the other way around. A virtual copy of its headquarters in Doha, the 5-star facility takes the idea of a fixed based operation (FBO) another step up the quality ladder, the entranceway worthy of a superior international hotel. On entering the RIzonjet site, landside, you realise you are very aware of arriving at a new concept in business aviation, as least as far as the UK is concerned. There is very obvious security and a liveried commissionaire with top hat to welcome you. If you are that way inclined your staff go one way and you, the VIP, go another. The facility is of 5-star boutique hotel quality, an exhilarating experience. The Rizonjet base is in fact two integrated operations, firstly a management building including what is effectively a top of the range hotel, and also a 62,000sq ft hangar, approved by all the necessary agencies and offering full service for Citation 500 aircraft, the Hawker 125 range, and Bombardier series. A unique walkway offers the opportunity for aircraft owners, operators and guests to view their plane being serviced without even the need to tread on the (spotlessly clean) hangar floor. Within the complex there is full dining facilities, private office and boardroom services, and even an area that can be turned into a children’s playroom, very useful with certain Middle Eastern clients. The décor is outstanding and is best described as 21st century Arab. Tasteful, of the highest quality, and very practical too. Prices, we are told, compete with other operators on the airfield, and elsewhere. The Jet Aviation centre at Biggin Hill is part of a worldwide operation owned by General Dynamics, manufacturers of the Gulfstream business jets. It has been established in South East London since 2002 and in comparison with Rizonjet can be best described as traditional, but to the highest standards. It is very comfortable without going over the top. Full facilities are provided for both passengers and aircraft crew. Technical support is offered for Honeywell and Rockwell Collins and a whole host of on-board aircraft equipment. To the list of planes supported by Rizonjet can be added the Dassault series, a popular aircraft in these parts. The main hangar was in fact formerly with the RAF but you would never know it, only the frame itself belonging to an earlier era. Once again it was spotless. New land has been purchased nearby with plans for an extension of the 55,000sq ft facility. Jet offers much the same facilities as its near neighbour, but without the glamour. What is does have is the backup and worldwide support of the Jet Aviation family of operations all over the world including the US, South America, Europe, Moscow and Hong Kong. The Jet Aviation Capability and Directory Guide is a very useful 62-page booklet setting out the facilities and licenses held at some 26 bases around the world.